Arsenal manager Arsene Wenger has announced that William Gallas will remain the club's captain next season. 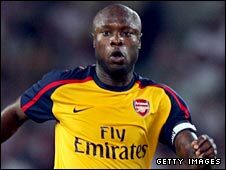 Wenger said in April he was to reconsider the role that Gallas has occupied since August 2007. A controversial first season as captain saw Gallas sit on the pitch after the Gunners' 2-2 draw at Birmingham and his style of leadership criticised. "If he plays, he will be captain," Wenger told the club website. "William will be the club captain, yes." When asked towards the end of last season if Gallas would retain the captain's armband, Wenger replied: "I cannot answer that question at the moment. I want to analyse the situation after the season." During the draw at St Andrew's in February, Gallas, 30, kicked an advertising hoarding and stood in the other half of the pitch as James McFadden scored a last-minute penalty. The two dropped points reduced Arsenal's then lead at the Premier League summit to two points and many believed Gallas' actions undermined Arsenal's title challenge. They won just two out of 10 subsequent games as their league and Champions League challenges came to an end. "You know I learnt a lot (last season)," Gallas told Arsenal TV. "You want to be the best captain and give good advice to your players, but sometimes you can make mistakes as well. "This season I know what I'm going to do and I know I am ready to change my way of speaking to the players." Last season Arsenal finished third in the Premier League and reached the Champions League quarter-finals but Wenger's men are still without silverware since 2005. "We have to win something because the trophies are more important at the end of the season," added Gallas. "Last season we were near to winning something, I hope this season it will be different."